The quickest and easiest way to plot your major and minor levels and their corresponding hesitation or reaction zones is here! Many trading theories focus on whole numbers, round numbers, double zeros, or major psych numbers. Whatever your specific theory or objective may be in regard to a major support or resistance area and the corresponding correction/expansion/hesitation zone around it, Major Levels Plotter allows you to quickly and easily stay on top of the next move without manually adding, removing, modifying, or otherwise taking a lot of time to setup your horizontal line levels! 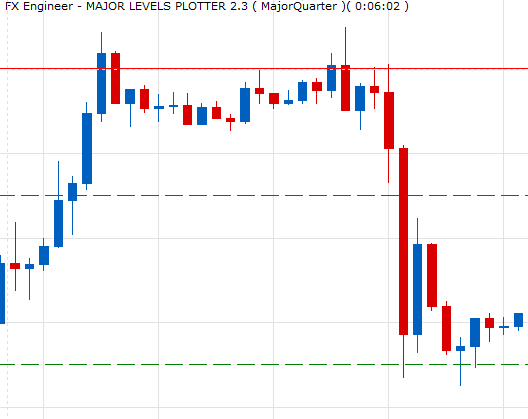 This indicator concisely allows users to select up to 4 distinct “Levels” to be plotted on their chart (MajorLevel, MajorQuarter, MinorLevel, MinorQuarter). Each of these levels allows the user to set the frequency/spacing of the level, as well as the hesitation zone/bands around each “major level.” In addition to setting these base distances for the level plotting, the distinct characteristics of each level group are fully in the users control with options for setting the line thickness, color, and style (dashed, dotted, etc). Additionally, the user has the ability to set a unique color for overlapping level lines as well as a “ShowTimeToEnd” feature so they can be fully aware of the upcoming bar close as well as any price lines that may warrant extra attention. Note: The application displayed on this page does not take in to consideration your individual personal circumstances and trading objectives. Therefore it should not be considered as a personal recommendation or investment advice. Past performance is not indicative of future results. There is no guarantee that the systems, trading techniques, trading methods, and/or indicators will result in profits or not result in losses.